Tired of wrestling with sticky, messy adhesive stickers just to label your magnetic surface? Ever had that adhesive tape mar your metal shelves with gluey residue? StoreSMART's Magnetic Rolls are the answer! Each ½" x 100 foot roll (that's 1200 inches) of flexible magnetic tape can be easily trimmed into strips that will fit any metal shelf or magnetic surface. They're simple to reposition, and can be cut with an ordinary pair of scissors. Magnetic roll - Print your own self-adhesive labels and affix to this magnet. Roll contains 100 feet (1200 inches) of ½" wide magnetic stips. Roll is black and magnetized on one side only. 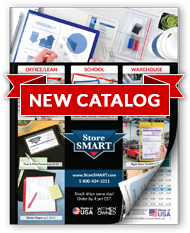 Use to label warehouse inventory, machinery, filing cabinets, lockers, magnetic boards, location markers, doors, and more.